Last week, in conjunction with a visit to my parents in Tucson, Audun and I took on the Coconino bikepacking loop, a 250-mile (400 km) route through Coconino National Forest in Arizona. 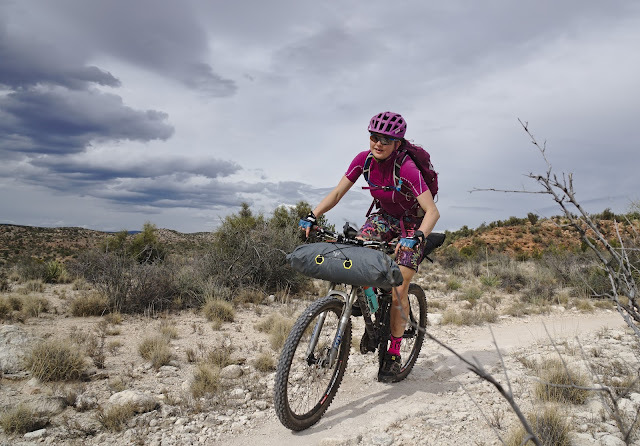 The route comprises of roughly 50% singletrack trails of varying technicality and 50% of dirt roads, also of surprisingly varying technicality. It’s ridden as a four-day stage race, but we took it on as a 5 day challenging adventure ride. 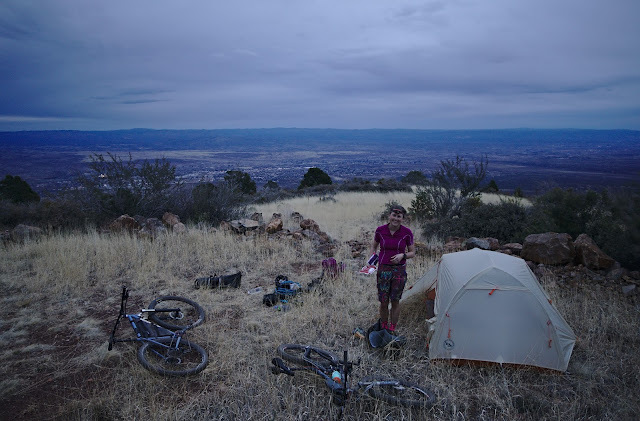 This was our first true bikepacking trip, meaning we carried camping gear on our mountain bikes. We do however have some experience bike touring, and refuge-based mountain bike touring on the Tour du Mont Blanc. My fully loaded Ellsworth Epiphany and Audun's Singular Swift (with a suspension fork and 11 gears for the occasion), ready to leave Broken Arrow Trailhead. 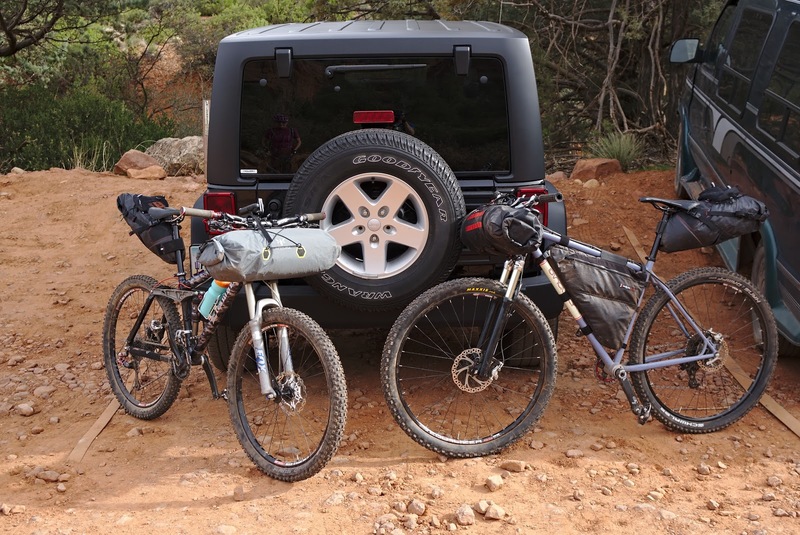 At 8 am, we were almost ready to leave our rental Jeep at the Broken Arrow Trailhead in Sedona and hit the trail. Our bags were packed, and I reminded Audun to pump up my back suspension a little since I was riding heavily loaded. Audun got out his suspension pump and started adding air, then unscrewed the pump from the valve once it was sufficiently filled. Shhhhhhhshh, my back suspension moaned heart renderingly, promptly letting out all the air that had been added and sagging. I am not a bike mechanic, but even I knew this was not the correct behavior for a back suspension. Twenty minutes later, we ascertained that the valve core was likely broken, and took apart the bikes and gear to drive to the local bike shop. We were there 20 minutes before they opened, but the mechanics preparing to open gave us a valve core and lent us the tool to change it. It was 9 am by the time we were on our way, set to ride 30-odd kilometers of Sedona singletrack. Audun near Bell Rock, with Cathedral Rock in the background. 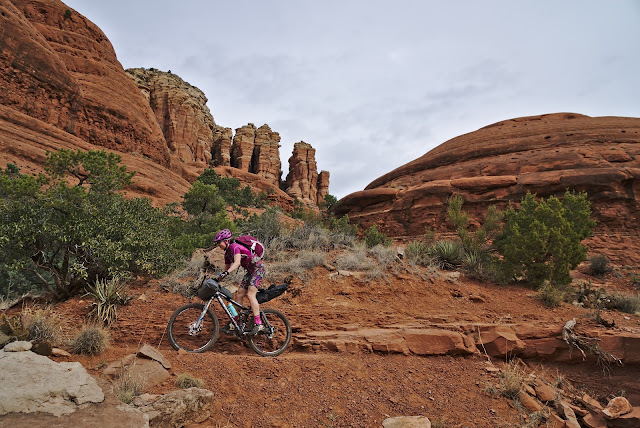 We rode a web of fun trails through Sedona, pedalling up Broken Arrow and swooping joyfully down the Little Horse trail. The red dust of Sedona was fleshed out with numerous prickly plants and cacti. What with the technical trails and numerous meetings with other riders and vortex-hunting hikers, going was slow. On the Templeton Trail in Sedona. We were nigh on 4 hours in and finally reaching the end of the Sedona trails when Audun turned to me and said, "I'm pretty sure I forgot to lock the car." Not ANOTHER delay, I thought. We discussed what to do, for a while wondering if we would have to pick up the highway and ride back to the trailhead to lock the car. Then we realized that Mom and Dad were hiking and likely hadn't left Sedona yet. We were able to get a text out and they locked the car for us, which was a huge relief. Pushbike on the Lime Kilm trail as we leave Sedona. After crossing through Red Rock State Park, we were to pick up the Lime Kiln trail that would take us all the way to Cottonwood. I was looking forward to easier going, and was sorely disappointed when the trail lead us up a rocky, prickly pushbike. "We'll be lucky if we even get to Cottonwood this evening, let alone Mingus Mountain," I grumbled. Then the Lime Kiln trail got easier. After the initial push bike, the riding became a lot faster. 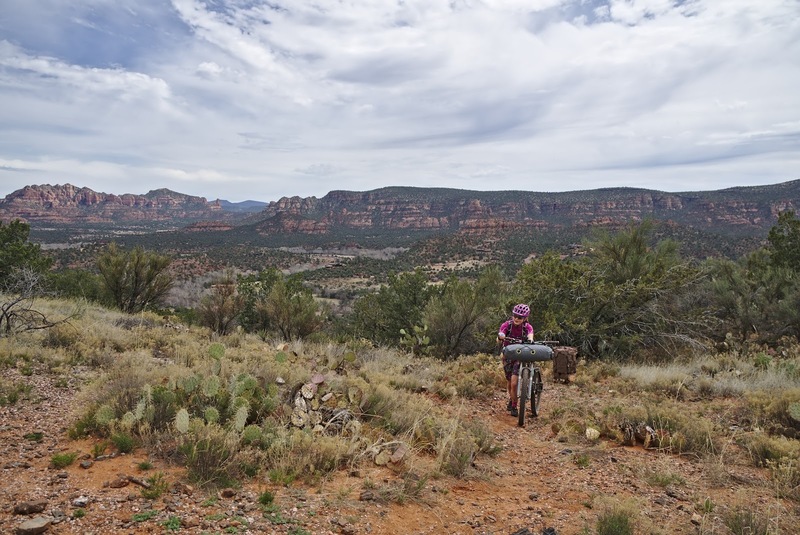 The red dirt of Sedona transitioned into white gravel, and we were riding through an open landscape studded with green shrubs, reminiscent of the African Savannah. It was grey and overcast, although the forecast didn't call for rain until the evening. It was late afternoon by the time we reached the town of Cottonwood. We stopped at a gas station to stock up on water before headed up dry Mingus Mountain. With the large array of junk food available, I was a literal kid in a candy store, although I didn't want to buy a ton of food that we would have to haul around. I came out with two ice creams, a bag of Doritos, sour gummy worms and some cured sausages. Health food. Mingus Mountain loomed ahead, and with only two hours until sunset it was seeming increasing likely that we wouldn't make the top in daylight. We had headlamps, but had not planned to ride in the dark. We discussed our options as we mashed up the steep gravel road. 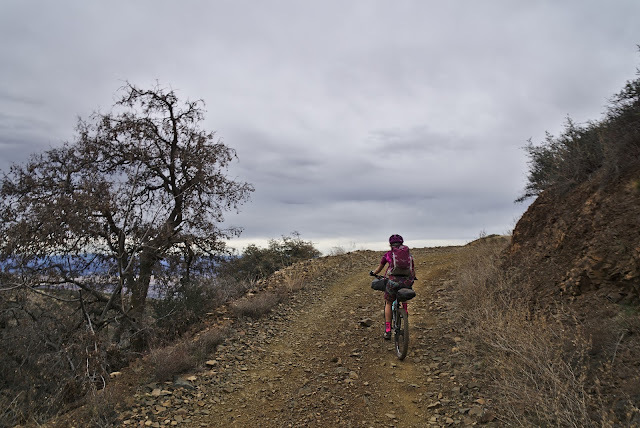 We could take on the infamous pushbike section in the dark, or we could take the Mingus bypass, going around the summit on gravel roads, or we could camp partway up and except defeat, not completing the planned distance for the day. Grinding the gravel up Mingus. My pack was heavy with water and pressed on the small of my back as I churned my pedals, inching forward up the steep grade. I was tired and ready to give up and ride the bypass, but Audun was insistent that we follow the true route and take the pushbike to the summit of Mingus. I was stilled undecided when we reached the junction. To the left was the gravel bypass, to the right was a road that purportedly turned into a steep trail that would force us to push our bikes the final 500 vertical meters to the summit. After a moments hesitation, I firmly turned my bike to the right. "Let's do this," I told Audun. A few minutes of pedalling later, we came across a beautiful meadow with views of all the terrain we had covered that day. It was sunset, and looked increasingly like rain. We looked at each other, and decided almost wordlessly that the pushbike would be best done in the light of the morning. The campsite on day one, halfway up Mingus Mountain. We made camp and cooked our freeze-dried meals before collapsing in our tiny tent. Listening to the wind and rain on the tent that night, I mentally prepared for the big push to the summit of Mingus. You make my backroad pedal from Cottonwood to Jerome look easy...tho it was anything but. I tip my hat! Have also done the Lime Kiln trail...some rough spots there. You are in my old stomping grounds. I'm anxious to read the rest. Thanks! Glad to hear your enjoying it! This was definitely a big challenge, we weren't even sure we'd be able to do what we set out to.